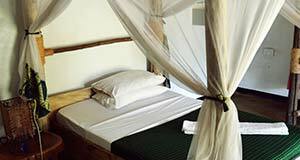 Honey Badger is a family-run lodge that offers comfortable solar-powered accommodation. We organise tailor-made safaris and mountain climbing expeditions as well as other local activities. Stay at Honey Badger and help us to support our local community. 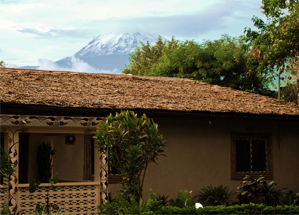 Situated in a rural community, the lodge offers breathtaking views of Mount Kilimanjaro (the highest mountain in Africa). We, Joseph and Jenny, and the Honey Badger staff warmly welcome you, and endeavor to make Honey Badger feel like home. We recognize that everyone has different preferences and expectations for their travels and are ready to accommodate your needs. We welcome all to come and enjoy our relaxing bar, lounge, restaurant and pool area. 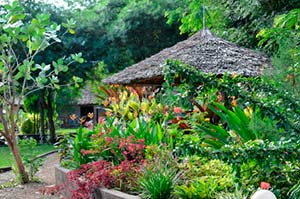 Our restaurant prepares a delicious unique fusion of Swahili and world flavours allowing our guests to not just see Tanzania but to taste it as well. If you are interested in the African Wild, or perhaps in conquering the Mighty Kilimanjaro, Honey Badger and it's sister company Milestone Safaris would be more than happy to help you plan the trip of a lifetime. Follow the link below to start start planning your adventure today! 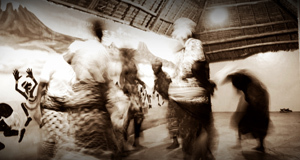 Our aim is to create an environment that not only showcases our wonderful country, but provides you, our guests, a lens through which you can understand our culture. Tanzania has so much to offer; her people, her natural beauty and her climate are hard to match anywhere in the world. However we want to be more than just a lodge and tour company. We are dedicated to community development and public health; we are passionate about the real life issues that affect our countrymen and women. We are working hard to make sure our lodge and our tour company are a mode through which we can help others, help those whose needs are greatest and ultimately help Tanzania to achieve everything she possibly can. We are committed to the welfare of our staff and our local community and are very grateful to all those who come to support our work. We warmly welcome you all to Honey Badger – Karibuni Sana! The best Gourmet Pizza’s in Moshi! Breath-taking views of Mount Kilimanjaro. © 2019 Honey Badger Lodge. All rights reserved.